Ancient Rome, AD 64. Alexander, a Jewish doctor loyal to Rome, has his life turned upside down when the evil emperor Nero Caesar launches a horrific persecution of Christians. 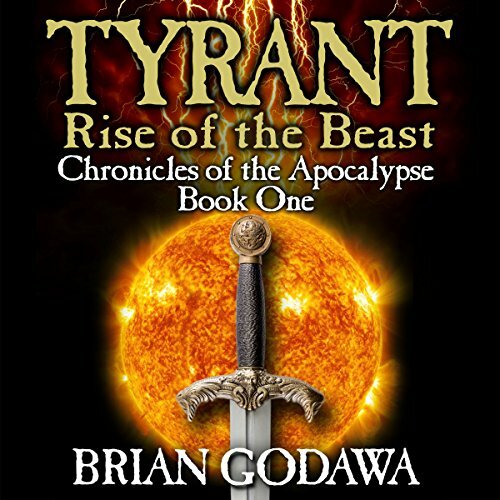 Tyrant: Rise of the Beast is Book 1 in the shocking controversial series Chronicles of the Apocalypse. It’s an edge-of-your-seat action-packed supernatural epic, written by Brian Godawa, respected Christian and best-selling Biblical author. The human story is not the only one in the book of Revelation or in this series. Chronicles of the Apocalypse shows the evil plans of Satan and his fallen angels the Watchers masquerading as gods of the nations at war. This gang of demons is not going down easily. First, let me say that I love this author, have re-read most of his books and anxiously await his new releases. This book was a disappointment all the way up until the last 3 hours. Everything before that was long, boring, and easily forgotten. I hope the next installment is better! Awesome. Another classic by Brian Godawa. A good eye opener for one of the most misunderstood books in the Bible. The only small section I did not particularly care for was Godawa's presentation of the 3 angel's attempt to capture Appollion before his decent to Tartarus. Godawa showed 2 of the 3 angels engaged in their silly rivalry and inattentive and that was part cause of them not capturing him. I could not wrap my mind around the fact that the evil one was stronger, swifter and far more focused than God's angels. But the book was an absolute classic; can't wait until Remnant comes to Audio books. Godawa is such an awesome narrator Great job! Good enough for a first book. I’ve lived a life filled with dispensationalism and Zionist teaching and learning. Over the last three years I’ve been on a journey unwinding much of that. Brian’s books have helped me to understand and learn something different. I finished the chronicles series and am working through this newer series. Brian does a great job of relying heavily on theology, history and the Bible and filling in with his fictional work where there are missing pieces. This work has been a gift to my heart. After reading Chronicles of the Nephilim, I couldn’t wait for another series by Brian Godawa! This book did not disappoint! Action packed and well researched! I definitely recommend reading the Chronicles of the Nephilim series as well! Both series will definitely enhance your understanding of biblical history and end times prophecy; these books are like no other work of Christian Fiction you’ve ever read. This was a very good listen and the author did a good job narrating. I found myself referring often to the Endnotes that were included with the Audible purchase. The mountain of Bashan and the Gates of Hades were of particular interest as I'd never heard them explained in the author's manner. Very, very interesting. I'm moving on to the next book in this series and I anticipate it will be just as good. I can hardly wait to get to the destruction of Jerusalem in "Resistant" and "Judgement". I've been reading Josephus' "War of the Jews" off and on, so I'm looking forward to Godawa's story on the subject.